If you aren't familiar with the Delirium trilogy, Requiem is the third and final book. In the Delirium series, love is a disease and the folks in the books have a procedure done to be cured from amor deliria nervosa (love). As I stated in my review of the first book, Delirium, love isn't just about the romantic love between two people. It's the love of friends, the love of hobbies, the love of the small details as well as the large. Like most dystopian books, there is a lot of suspense, darkness, and conflict in this series. Good times (for the reader). The second book was kind of lackluster for me, but the ending... oh, the ending. I'm not normally a fan of the cliffhanger, but I did love the ending to Pandemonium. I needed Requiem after that ending! 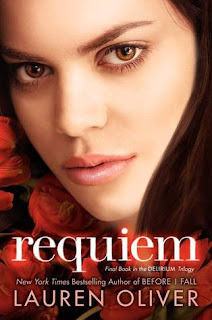 Thus, I've been waiting and waiting to read Requiem which you know if you follow this blog. I hoped Requiem would pick up just seconds after Pandemonium, but I was very pleased with how Requiem began. In fact I was pleased with most of Requiem. I'd seen the low ratings. I'd read some of the spoiler free reviews. I was happy I was loving it so much because my expectations were no longer high. Once I reached the end of Requiem, however, I understood all too well why this book was not well received. My poor hubby had to hear so much bitching from me last night. My main beef with this book (and the entire series I have devoted so much time toward) was there was no ending. No ending, no resolutions. I'm all for literature that makes me think. I have no problem when things are left up to my imagination, but when you leave the actual story up to my imagination, I feel robbed. 2 stars - One star because I thought I was going to love it, and one star for Hana. Ugh I am right there with you, Jennifer. I feel like we didn't get enough resolution and it made me so sad! When it ended I was like "this can't be over. I am missing pages, I have to be missing pages." But I wasn't. I still did like the book overall more than you did I guess, but I would have liked more resolution. Fabulous review! When it ended I literally said "WHAT?!" out loud. I couldn't believe it. I was really enjoying Requiem when I thought it would all be resolved. Once nothing was resolved, I was just left scratching my head. It wasn't enough for me. This is one of those series that I haven't picked up yet because of the mixed reviews. I'm not sure I want to devote time to a series that I think will only leave me with more questions than answers. I felt this way about the Maze Runner series. Oh, really? I was thinking of starting the Maze Runner series really soon. Oy. I may not now. I can't take the disappointment again. It pains me to say I no longer recommend the Delirium series. Hmmm. Okay. I agree with you. I don't mind open endings, but sometimes you need more of an answer from a story. I'm sorry you feel robbed! Thanks. I'm really bummed about it. It's going to affect my reading choices for quite some time. Oh no! Maybe there should be another one. Is the door left open for that. I'm reading The Maze Runner series right now. That is a very frustrating series to because you think you are learning something and making progress and then find it is all a lie. After the fourth or fifth time it gets old. I'll finish the series though. Gah! I'm promise I'm not an illiterate idiot. I know I need to proofread my comments. Sorry about that. Oh, no. Did you make a mistake?? Haha. Thanks for helping save me from reading The Maze Runner series. I was planning to start that one soon. No, I don't think the door was left open for the Delirium series to continue. Every time I try to think about what she was going for, it just gives me a headache. I don't know how I feel about open endings either. They could potentially work really well but only if the author executes it properly. I haven't read the whole series yet. I started reading Delirium and stopped. I don't know if I'll bother picking it back up again now!